What do you call a barbeque without PCF Jerk kabobs? ...that's right a "Bare-b-que." 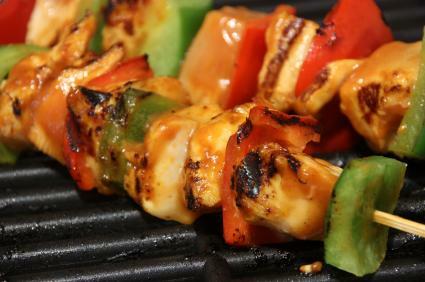 Don't allow your barbeque to be bare or bland, throw our JCS Jerk seasoned kabobs on the grill and watch everyone come back for more. Sauté onion in oil then remove from heat. Stir in jerk seasoning, soy sauce and lemon juice. Place the meat, green pepper, tomatoes, & onions in a large bowl. Pour in the onion and sauce mixture to the vegetables. Cover, marinade overnight in refrigerator. Remove meat & vegetables from marinade and set the marinade aside. Alternate meat & vegetables on skewers. Grill over medium coal heat for about 5 - 10 minutes on each side. Brush frequently with reserved marinade.